Preparation takes about 45 minutes, cooking takes approximately 15 minutes for the pastry, 10-15 minutes for the cakes, 10 minutes for the syrup and 5 minutes for the cherries. 1. First prepare the pastry according to the recipe for Apple, Pear or Plum Cake. Lightly grease a baking sheet and pat the pastry out into a round shape about 5mm/ 1/4 inch thick. Prick lightly with a fork and bake in a preheated oven at 190C / 375 F / Gas Mark 5. Cook until the pastry browns lightly around the edge and feels firm in the center. Cut a circle 17.5cm / 7inches in diameter while the pastry is still warm. Use a cake pan as a guide. Remove the excess pastry and allow the round to cool completely on a baking sheet after loosening it from the bottom. 2. Grease three 17.5cm / 7 inch round cake pans and place a circle of greaseproof paper in the bottom of each. Grease the surface of the paper and sprinkle the pans lightly with flour, tapping to knock out the excess. 3. Soften the butter until it runs easily from a spoon but is not melted. To do this leave the butter at room temperature for several hours and then beat vigorously with a wooden spoon, use a food processor or electric mixer. 4. Beat the eggs, vanilla and sugar together on high speed until the mixture is thick and fluffy. 5. Sift in the flour and cocoa 2 tbsps at a time, folding it into the egg mixture with a large metal spoon or rubber spatula. Finally fold in the soft butter. Divide the mixture between the cake pans and bake for about 10-15 minutes, or until a knife inserted in the middle of the cake comes out clean. 6. Allow the cakes to cool in their pans for about 5 minutes and then loosen from the sides with a sharp knife. Turn the cakes out onto wire racks to cool completely. Gently peel off the paper. 7. While the cakes are baking, prepare the syrup, Combine the sugar and water in a heavy-based pan and bring to the boil over moderate heat, stirring only until the sugar dissolves. Raise the temperature and allow the syrup to boil rapidly for about 5 minutes. Remove the pan from the heat and allow the syrup to cool. Stir in the kirsch. Place a tray underneath the cooling rack and prick layers of cake with a fork. Pour syrup over cakes and leave to soak. 8. If using fresh cherries for the filling, place them in a pan with enough water to cover after they have been pitted. Bring them to the boil and then reduce the heat and allow to simmer for about 5 minutes, or until tender. Drain them and pat them dry with paper towels. 9. Beat the cream until it thickens slightly, add the sugar and continue beating until the cream forms peaks that hold their shape. Fold in the kirsch. 10. 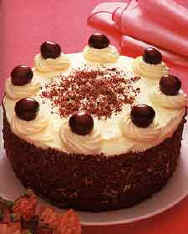 To assemble the cake, place the pastry layer on a serving plate and brush with 15ml / 1 tblsp softened red-currant jelly. Place one chocolate layer on top of the pastry and press down lightly to stick the two together Spread one third of the whipped cream on top of the chocolate layer and cover with half of the cherries. Place another chocolate layer on top and press down slightly. Spread another third of the whipped cream on top and sprinkle over the remaining cherries. Press down the top layer and cover the top and sides with the plain whipped cream. Press grated chocolate around the sides of the cake to cover the cream evenly Decorate the top with rosettes and sprinkle over any remaining grated chocolate. Decorate the rosettes with a fresh cherry or a cocktail cherry.